In September 2015, during the 25th Anniversary of the founding of the Diplomacy Training Program (DTP) by Professor José Ramos- Horta and Emeritus Professor Garth Nettheim, a new program was launched in Australia: the DTP Fellows Program. 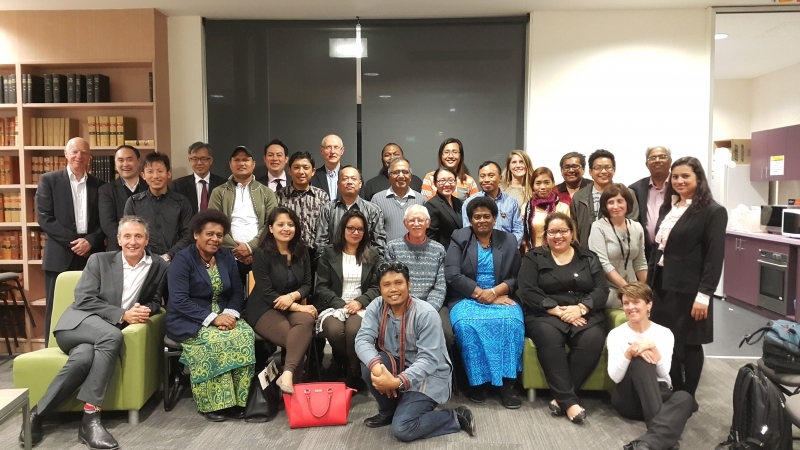 With funding from the Australian Federal Government under its Australian Awards Fellowship Program the Diplomacy Training Program brought 18 civil society advocates selected from across the region to Australia for an intensive and tailored training and networking initiative. The DTP Fellows came from Bangladesh, Fiji, India, Nepal and Myanmar where they work on some of the most challenging issues in their respective countries. They are active on women’s rights; the rights of migrant workers; Indigenous peoples’ rights; corporate accountability and sustainable development. Most are alumni of previous DTP courses and were nominated by some of DTP’s partner organisations in the region. The Fellows Program, developed to respond to the needs and experience of each participant, was comprised of specialist training sessions with leading human rights and business academics and practitioners, field visits to build practical understanding of the application of standards and practices to promote sustainable and equitable development and opportunities to engage with and develop contacts with government, private sector and non-government representatives. Incorporated into the program were opportunities for the participants to prepare and deliver presentations to build their skills in advocating their issues of concern.